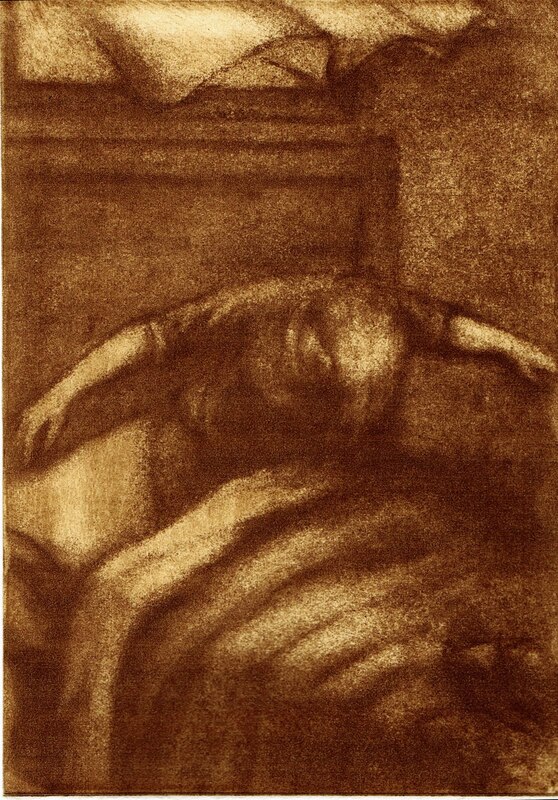 For IF: As she stirred from her sleep, she began to lift off the bed and into another world. This is a cropped version of an older drawing. I made it into a print to test my lightbox for exposure times on this type of drawing. I think I'll print the whole thing on a larger plate next. Wow! Feels like I'm lifting. I'd love to see the whole thing. The effect is wonderful! Really cool. I really like the brown color. Lovely illustration. really nice value work on this!!! Beautiful feeling comes from it. Yikes--what a concept. Beautiful beautiful print--I love the brown ink, and the feeling on another world (like perhaps a Kafka story....).